Williams & Fudge, Inc. is proud to announce, for the tenth consecutive year, being named one of America’s Best Call Centers to Work For, formerly known as the Best Places to Work in Collections. 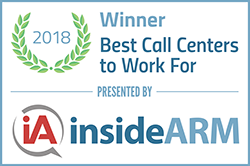 This survey and award program, established by insideARM and administered by Best Companies Group, was designed to celebrate excellence among call center work environments in customer care, collections, outsourcing and online chat services. This year, 25 companies met the standard to be selected. The Best Call Center to Work For list is dived into three size categories; Small (15-49 employees), Medium (50-149 employees), and Large (150+ employees). Companies from across the U.S. entered the rigorous two-part survey process to determine the Best Call Center to Work For. The first part consisted of evaluating information about their policies, practices, philosophy, systems and demographics. The second portion consisted of an employee survey, designed to measure the overall employee experience. The combined scores determined the top companies and the final rankings. Best Companies Group managed the overall registration, survey and analysis process and determined the final rankings.